The UC Hopland Research & Extension Center has been the repository for Mendocino County bird observation records for about 25 years. "Birding" is a rapidly growing leisure-time activity in North America and portions of the record keeping are quite serious.... as kept track of by local, regional, national, and continental entities. The North American Birds quarterly publication under the direction of the American Birding Association has established regional and sub-regional editors that compile important bird observation reports and submit them for publication. Mendocino County falls within the Northern California Region, and HREC Superintendent Robert Keiffer compiles Mendocino County records for the spring, summer, fall, and winter periods and submits those reports to the four regional editors. Here you see a new bird species for the county that was found on the coast near Fort Bragg last June 27th. 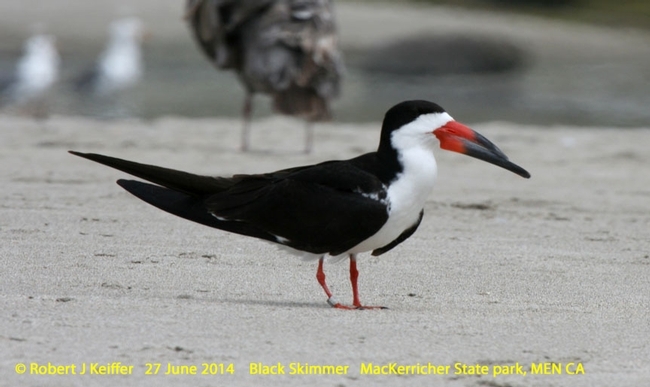 The Black Skimmer species has flown by the Mendocino coastline in the past as known from rare past west coast records, but this is the first occurrence of one actually seen and reported here from Mendcoino County. From the band on its foot we know that this bird was banded at the Salton Sea in southern California in the year 1999 or 2000. This bird should be accepted by our local review committee to be the 417th bird species (including established introduced species) for Mendocino County.